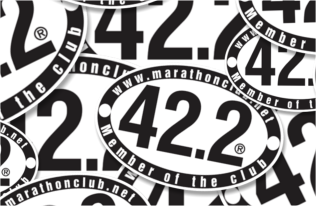 Member of the 42.2 Club® – How the marathon distance was set to 42,195 meters or 26 miles and 385 yards ? How the marathon distance was set to 42,195 meters or 26 miles and 385 yards ? In 1908 London Olympic games, the British Royal Family wanted the race to begin beneath the windows of the nursery at Windsor Castle and finish opposite the royal viewing box at the Olympic stadium. The start and finish lines were adapted to accommodate the request, and since then the marathon distance was standardized to that distance- 42 kilometers and 195 meters (42.195 km) or 26 miles and 385 yards (26.219 miles). All 42.2 purchase orders submitted until April 20, were mailed out by April 21. Need support ? please contact us. Save on order of 3 bumper stickers. Instead of 22.50 USD, when you order a triple, it is 6.50 USD each, you pay only 19.50 USD. Save on order of 3 official Mugs. Instead of 42 USD, when you order a triple, you pay only 37 USD. Eliud Kipchoge (Kenya) won the 2018 Berlin Marathon at 2:01:39 hours, the new world marathon record. Elihud Kipchoge (Kenya) is the world fastest marathon runner. He ran and finished the 2018 Berlin Marathon on September 16, 2018, at 2:01:39 hours. The official Member of the 42.2 Club® set of coasters are now on Sale for 11 USD per set, including tax. Eliud Kipchoge (Kenya) is 2018 London Marathon winner (Men). His time is 2:04:16 hours. Vivian Cheruiyot (Kenya) is 2018 London Marathon winner (Women). Her time is 2:18:31 hours. Yuki Kawauchi (Japan) is the winner of 2018 Boston Marathon (Men). He ran the 42,195 meters (26 miles and 385 yards) at 2:15:54 hours. Desiree Nicole Linden (USA) is the winner of 2018 Boston Marathon (Women). She ran the 42,195 meters (26 miles and 385 yards) at 2:39:54 hours. New Offer !!! 3-Pack Mugs. 3-Pack Member of the 42.2 Club® Official Mugs for 36.00 US $ (Sales tax included). Just click the link and follow the instructions! Make sure you change the size and position of the 42.2 Club logo so it won’t hide you from the picture! Fartlek is a Swedish training method based on a continuous running sessions and a mixture of interval. The intervals could be distance based or time units based or a mixture of them. Geoffrey Kamworor (Kenya) is the winner of today’s 2017 TCS New York City Marathon. He finished at 02:10:53 hours (just 3 seconds ahead of Wilson Kipsang from Kenya too. Please join us at Member of the 42.2 Club LinkedIn group. A bizarre incident in which the leading six runners took a wrong turn assisted local runner Eyob Faniel (Italy) to win 2017 Venice Marathon at 2:12:16 hours. Lawrence Cherono (Kenya) is the 2017 winner of TCS Amsterdam Marathon at 2:05:09 hours. Rupp, Galen (from Portland, OR, USA) won the 2017 Chicago Marathon at 02:09:20 hours. Last year winner, Kirui, Abel (from Kenya) finished second, 28 seconds after the winner. Dibaba, Tirunesh (from Ethiopia) was the first among the women at 02:18:31 hours. Today’s results are faster than 2015, 2016 results. Eliud Kipchoge (Kenya) won the 2017 Berlin Marathon at 2:03:32 hours. Geffrey Kirui from Kenya just won the 2017 World Championships Marathon. He finished the 42,195 meters at 2:08:27 hours. Tamirat Tola (Ethiopia) finished second at 2:09:49 hours. Daniel Wanjiru (Kenya) who was the 2017 London Marathon winner – finished at 8th place, at 2:12:16 hours. An unofficial marathon record at 2:00:24 hours – Eliud Kipchoge from Kenya ran an unofficial marathon held at the Monza race track, Italy and finished at 2:00:24. Eliud Kipchoge was also the winner of 2016 Rio Olympic Games Marathon. Ghirmay Ghebreslassie (Eritrea) is the winner of 2016 TCS New York City Marathon. He reached the finish line after 2:07:51 hours. Mary Keitany (Kenya) was the first among the women runners, at 2:24:26 hours. Mark Korir (Kenya) won the 2016 Frankfurt Marathon at 2:06:48 hours. Member of the 42.2 Club ® were distributed in Paris Marathon and in Marathon de la Baie du Mont Saint-Michel, France. Ask your race coordinator for the bumper stickers. 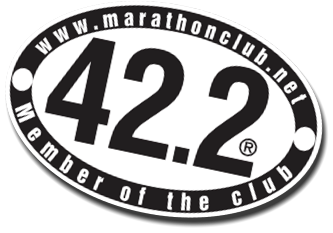 Official Member of the 42.2 Club ® stickers were distributed in the runner’s bag of Maratona San Antonio ®, held in Padua (Padova) Italy on April 27th 2014.  All rights reserved© Member of the 42.2 Club® and its bumper sticker are registered trademark worldwide (under class 35 and class 41). It is unlawful to reproduce a registered trade mark, or imitate or create a similar symbol with likelihood of confusion, without prior written authorization from a trade mark owner. Violation of a registered trade mark may result in legal penalties.